I recently won a BBC Micro issue 3 board and case on ebay. One of those situations where the seller decides they could make more money if they split it up and sell the parts separately. Not my favourite tactic. I didn't see the power supply on there, so it may have suffered from exploding suppression caps. 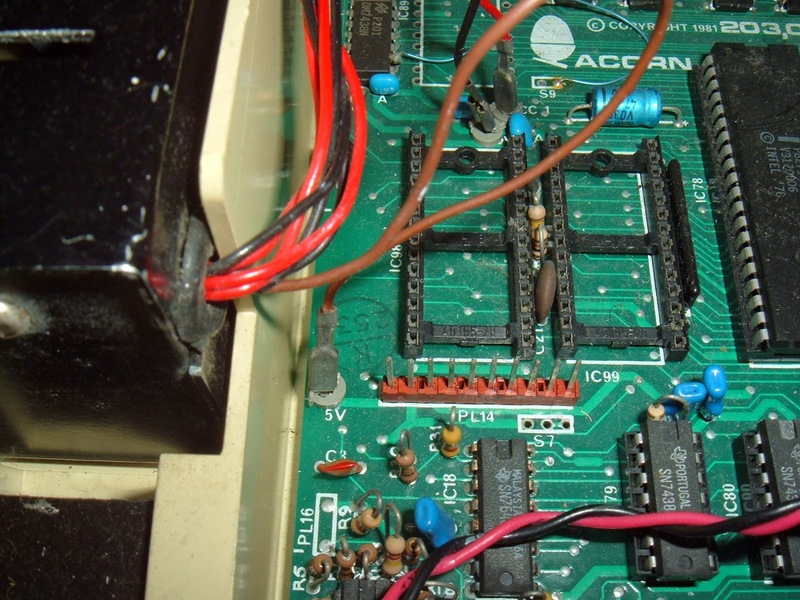 A common issue on BBC micros, and an easy fix. I was going to insert a link to my previous article about BBC power supply repairs. 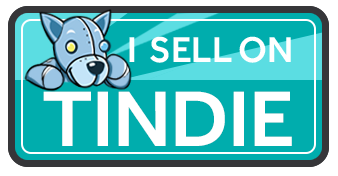 I've done loads of them, but it seems I've never written a blog post about it. I'll make a note to do that with the next one. So this is what I got, the case and the main board. 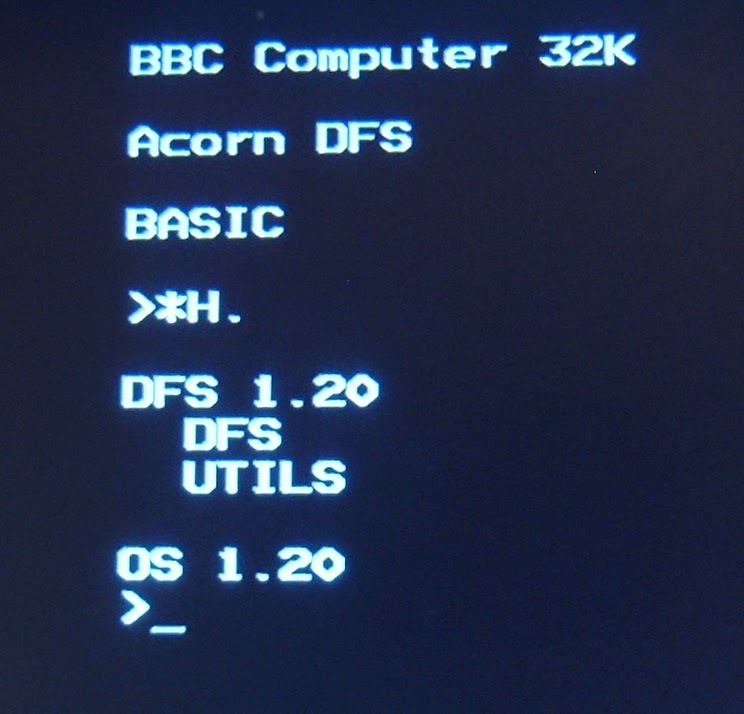 The aren't many of the very first BBC computers, issues 1 and 2. The issue 3 was the first to appear in quantity. After that, there were lots of issue 4's. Issues 5 and 6 weren't released. The issue 7 was the final and most prolific release, and most of the BBCs I see tend to be issue 7's, with the occasional issue 4. I don't have a complete issue 3 machine, so now is the time to make one. 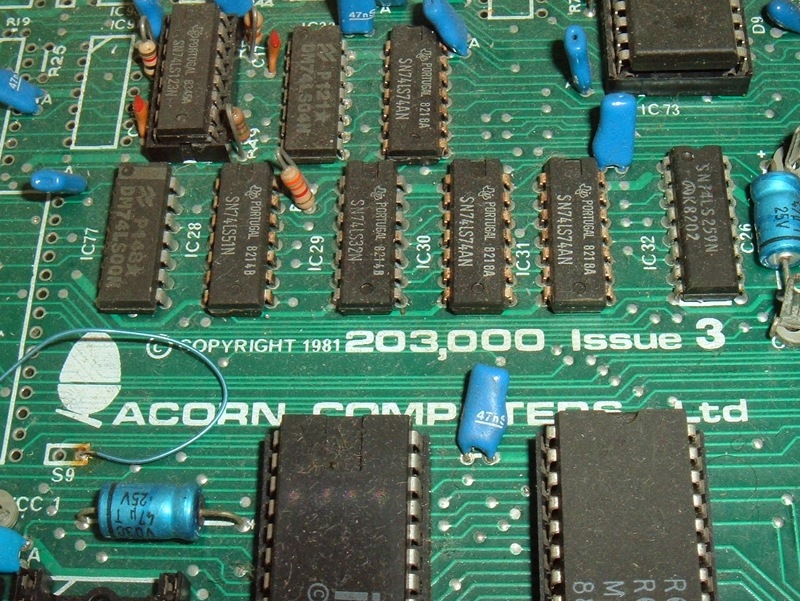 This is one of the machines produced by ICL, so has an ICL serial number, rather than the standard Acorn one. 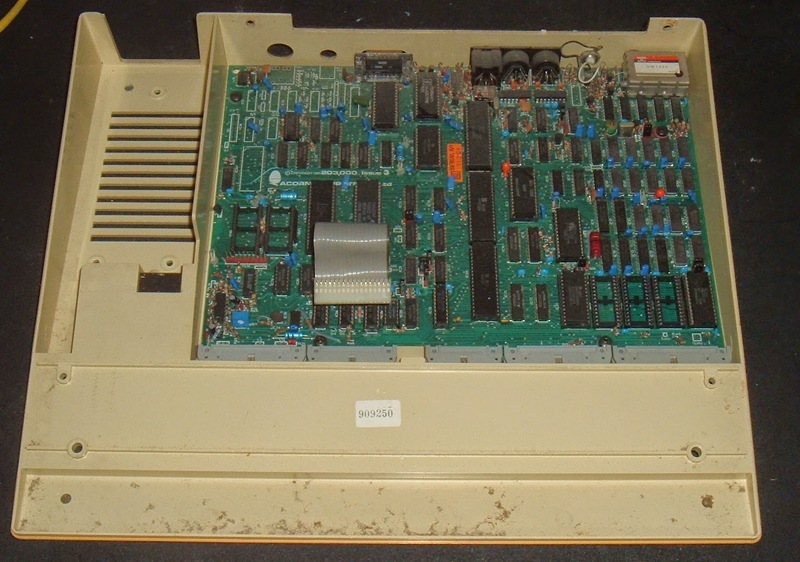 The main board appears to be in reasonable condition. 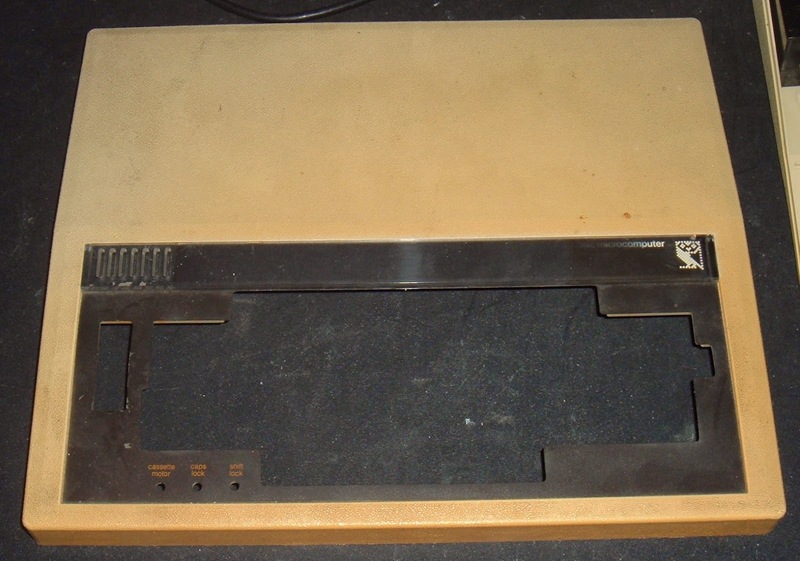 It would have been a model B, as it started with all the connectors fitted and 32K of RAM, as 16x Fujitsu MB8118-10 (4116 clone) DRAMs. Well, I say 16, 15 of them were like that. One has been replaced by a Hitachi HM4816A. Based on the date codes, it would have been produced in early 1982. Continuing the industrial archaeology, it would appear that the system 6522 VIA was replaced some time after 1988 with a Rockwell R6522. 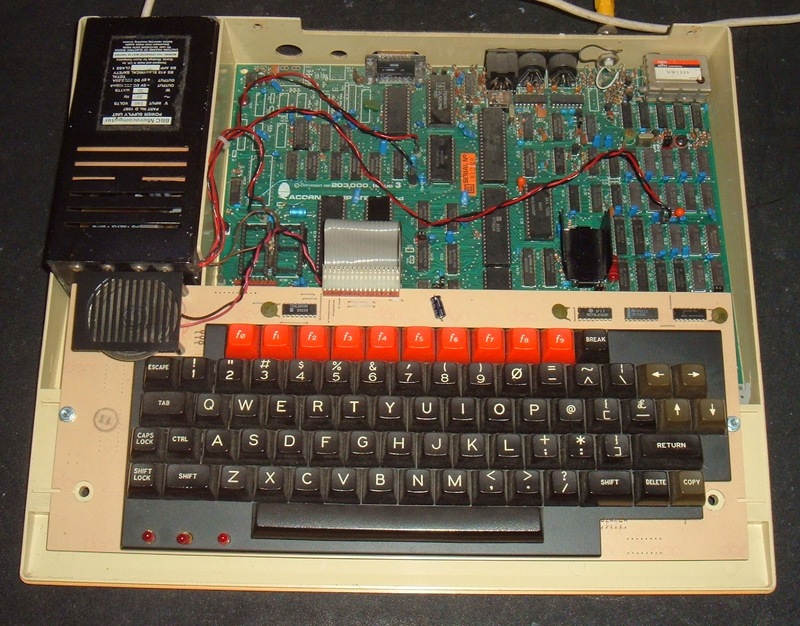 Below that, it look like in 1984, it had an Intel 8271 floppy disk controller upgrade fitted. 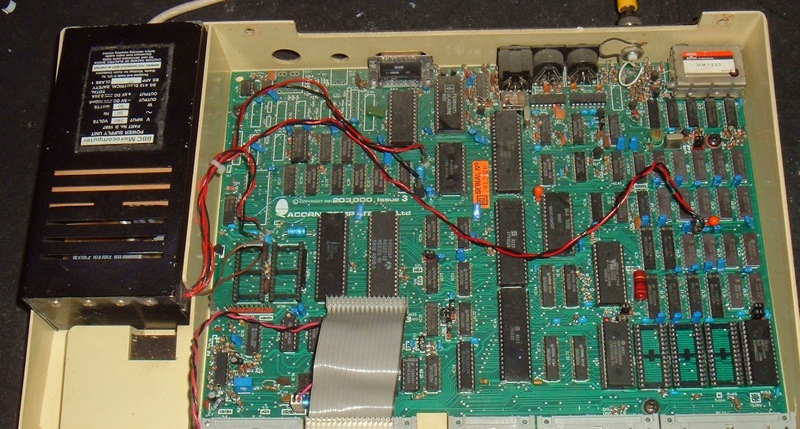 The 8271 used the older FM (single density) encoding, so had a maximum capacity of 400K for a double-sided, 80-track disk, accessed as two separate sides. 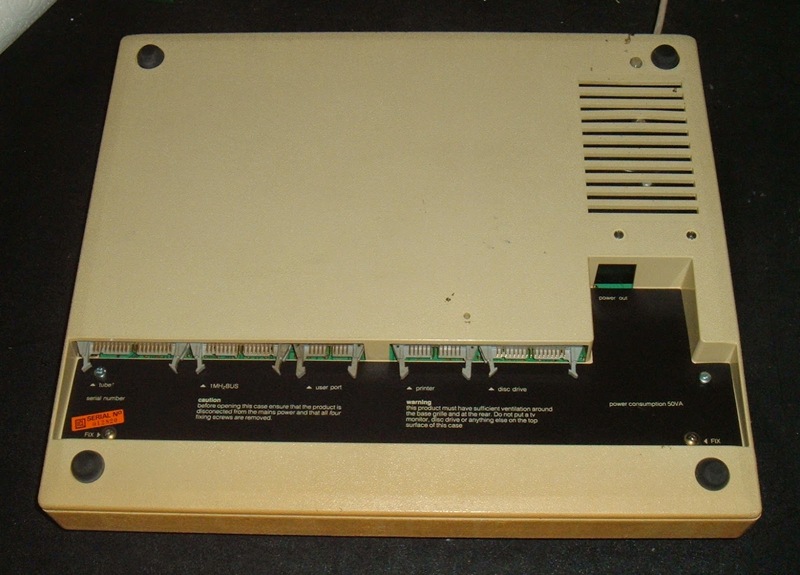 Soon after the release of the BBC, add on kits became available which used the cheaper and faster WDC1770 floppy disk controller, which also had double the capacity using MFM (double density) encoding (thanks to Alex Taylor for the correction). The 8271 is one has the one it was originally designed to take, and even the much later model B+ has been designed to take either the 8271 or the 1770. (yes, model A, B and B+ may sound familiar to Raspberry Pi fans, but the BBC was first by about 30 years). The BBC has 5 ROM sockets. The one on the left is the 16K OS ROM. The other 4 are paged 16K ROMs, which one is selected is based on a register. The BBC can access any one of up to 16 ROMs, although only 4 sockets are provided. 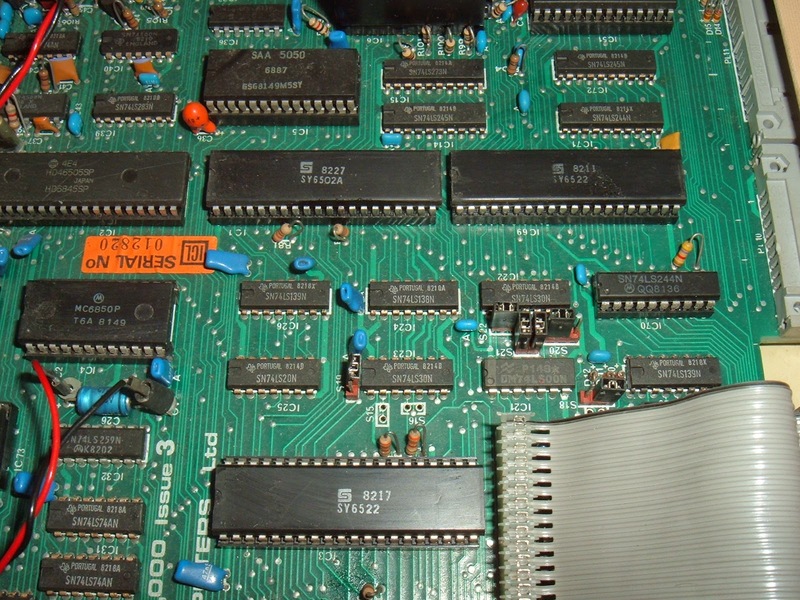 With a simple wire modification, it is possible to use 4 64K EPROMs, each with 4 images on to get all 16 ROMs. Again, I thought I'd written a blog post about this. I'll add that to the list as well. 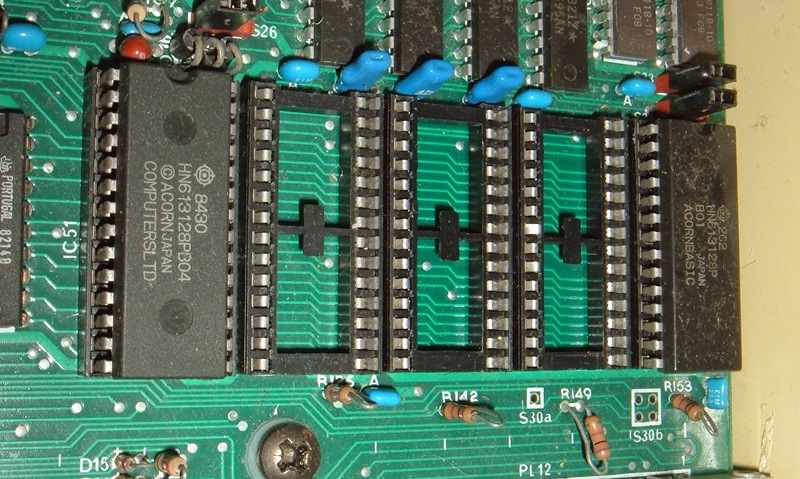 The board underneath two of the sockets looks suspiciously clean, the ROMs in there were probably sold off separately as well. The one on the right is BASIC. There should have also been a DFS ROM to go with the 8271 floppy disk controller, so I've burned one. Since this is going to be an assembly of parts, I've decided to keep it as an issue 3 machine. 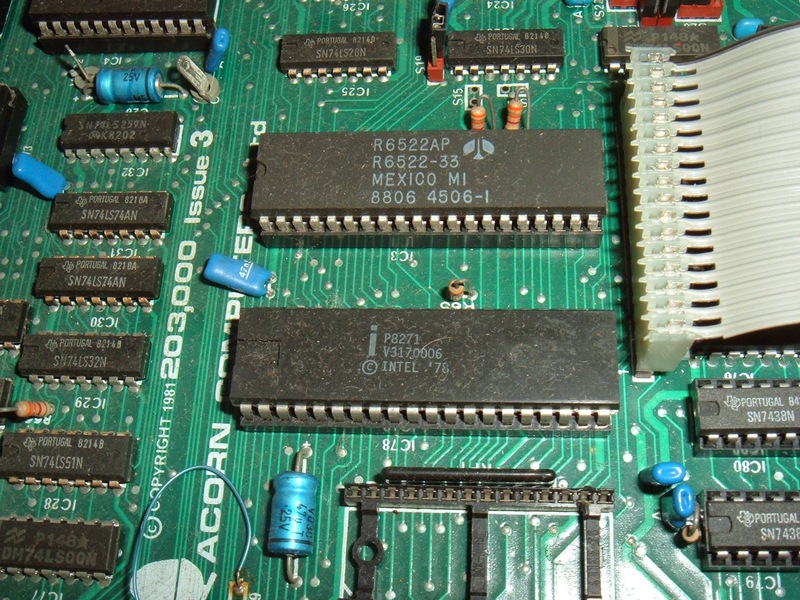 The 6502 CPU and the user port 6522 VIA are the usual Synertek branded chips, and the original system 6522 would have been the same. So I replaced the Rockwell R6522 VIA with a Synertek SY6522 to match. 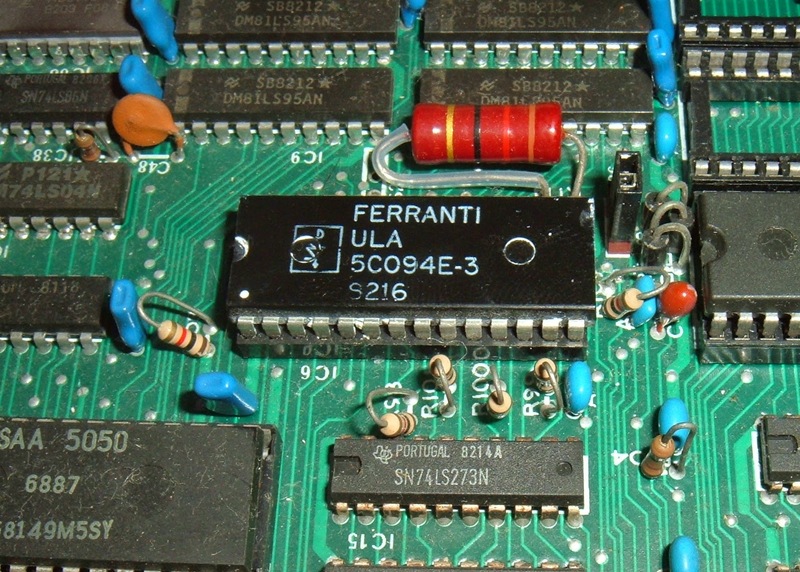 The Ferranti video ULA has also been replaced with a VTI VC2069, as would have been used on issue 7 boards. Again, I have decided to roll this back to the it's original state. 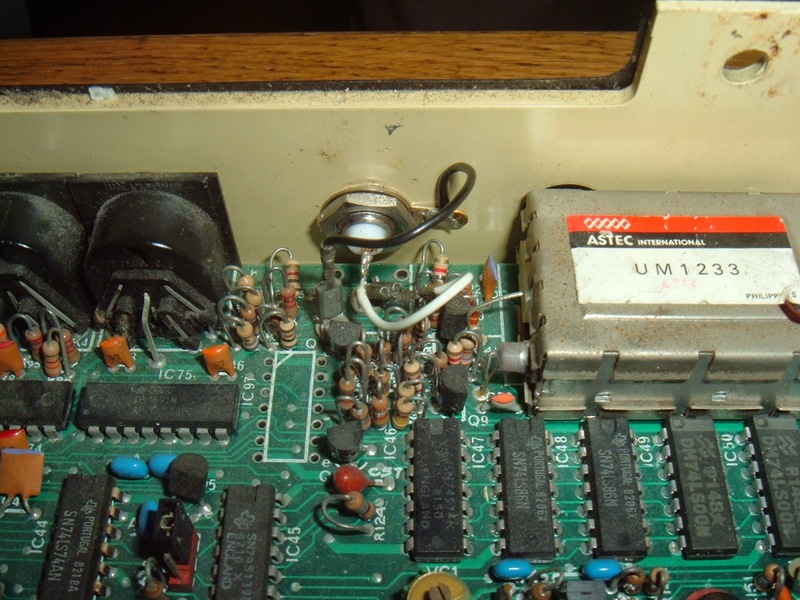 The Ferranti ULA is less efficient than the later one, and needed a heatsink. With fresh hearsink compound applied, that's the board sorted, now it needs a power supply. 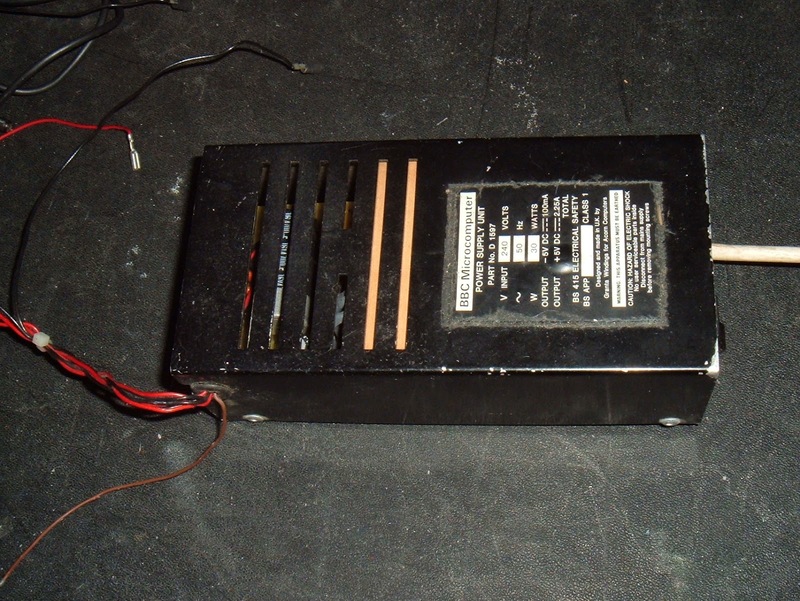 Later BBC micros had switch mode supplies, but the early BBC micros had these black linear power supplies. This is one I've had for years, I was given this as it's owner replaced it the a switch mode one. The linear ones do not have a disk drive power connector, and the owner wanted to power an external drive. Only 20 years later, I finally have a suitable case for it! The power connector for the BBC main board is unusual. Rather than one plug and thick tracks going around the board, they have three pairs of 0V and 5V connectors which attach at various points across the board. 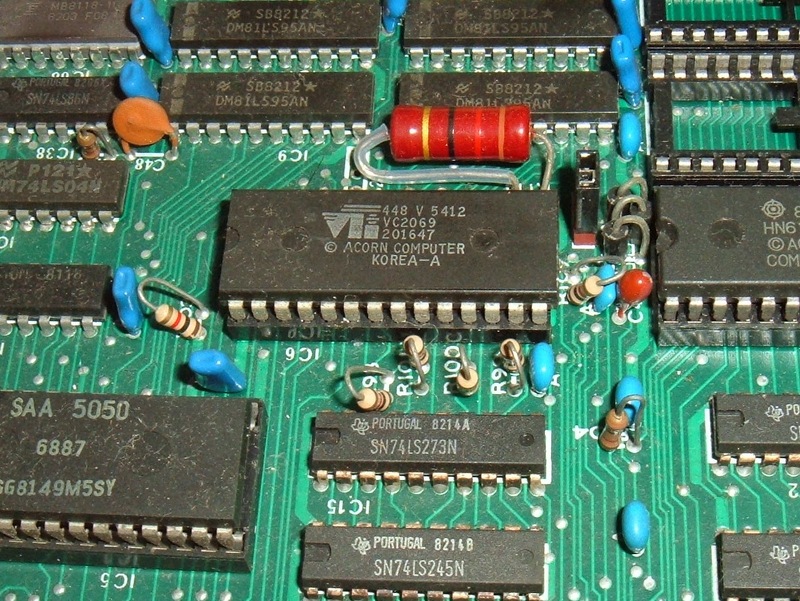 The red and black are marked 0V and VCC. The brown is -5V, but the label seems to be missing the - sign. That's one to watch out for. That's the power installed, time for a keyboard. 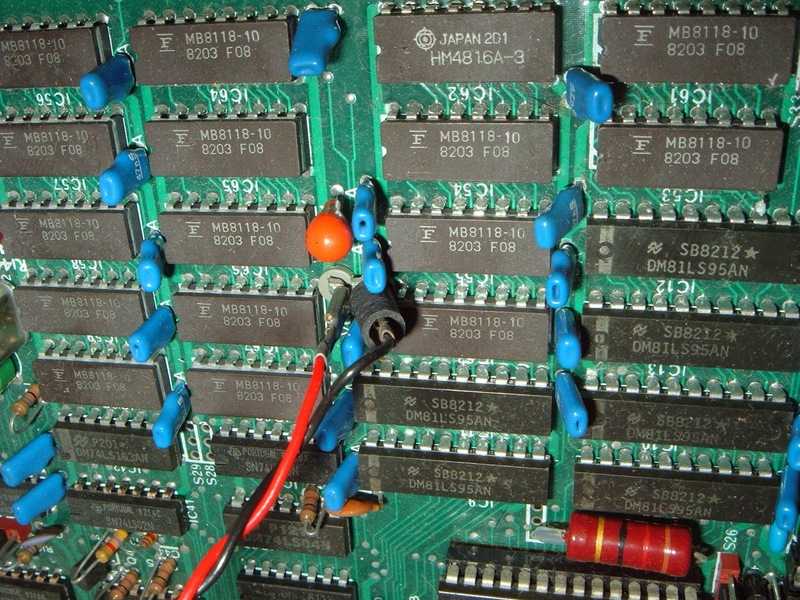 Some of the early ones had a DIP switch installed bottom right. 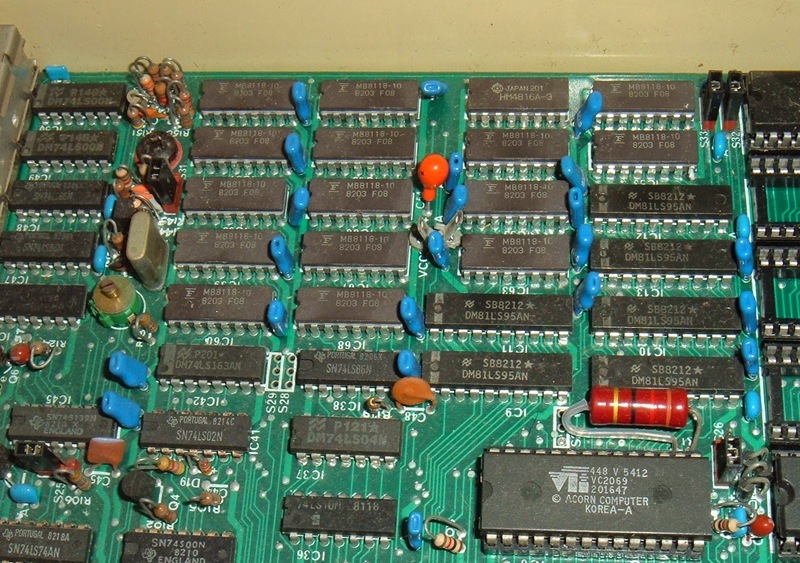 I have one of those somewhere, but the PCB was poorly etched and it's a bit intermittent. This is a spare one, I think from an issue 4. There are a few differences at the back of the case, compared to later versions. The wording is different. Here Allen Boothroyd is credited. On later machines, that is moved to the bottom of the case. The ventilation slot is a lot larger, it was reduced in height later on to stop small fingers getting inside. This looked like it might have been taped up at some point,but that cleaned up ok. Note also the reset switch is labelled. All machines have space to install a reset switch, and a hole in the back, but I don't think there were ever fitted. Only the early ones have it labelled on the back, the rest have it covered up. Like the Econet port, this would have have a plastic cover, but it has been punched through at some point. Most of them have. I've put a piece of black card to cover the holes. The BBC was well designed to be expanded and serviced. There was always one annoying part which was the BNC video jack. 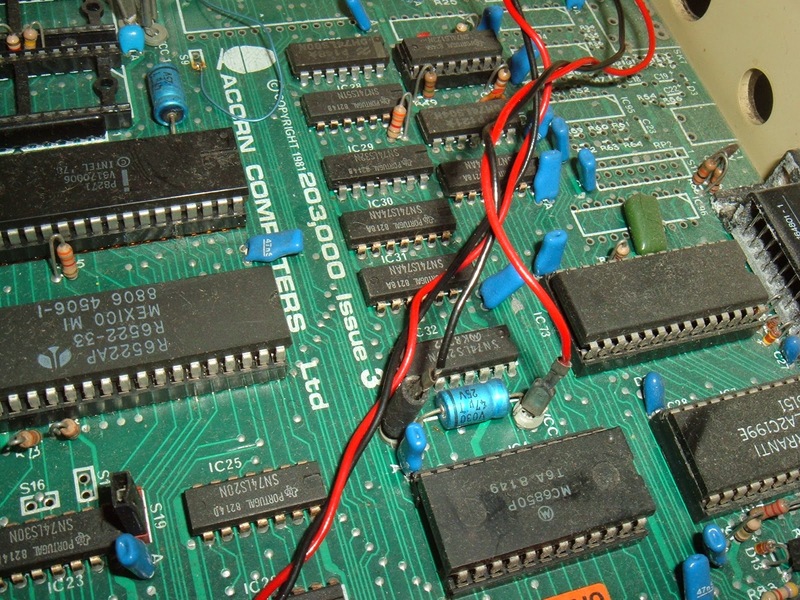 That had to be desoldered to removed the board, and often didn't get reattached if the owner was using an RGB monitor. I was surprised to see this version had a removable connection, using the same spades as the power supply. Shame they discontinued that in later revisions. 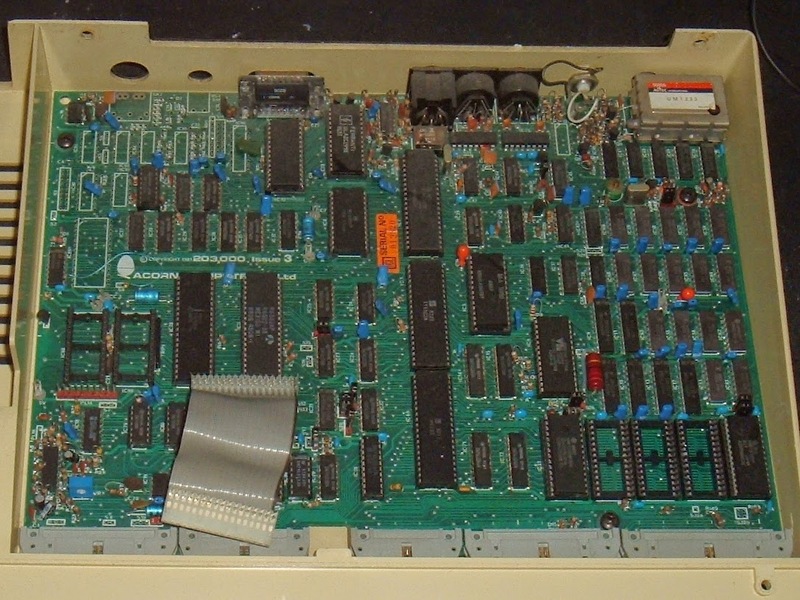 The board appears to be laid out to take a PCB mounted BNC socket, but I've never seen one fitted. 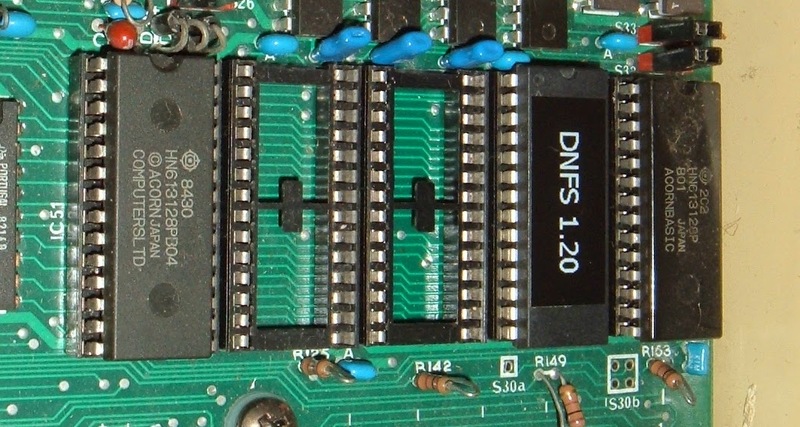 Underneath is the usual collection of IDC expansion connectors. The power out is marked, but there is no socket on the linear power supplies. 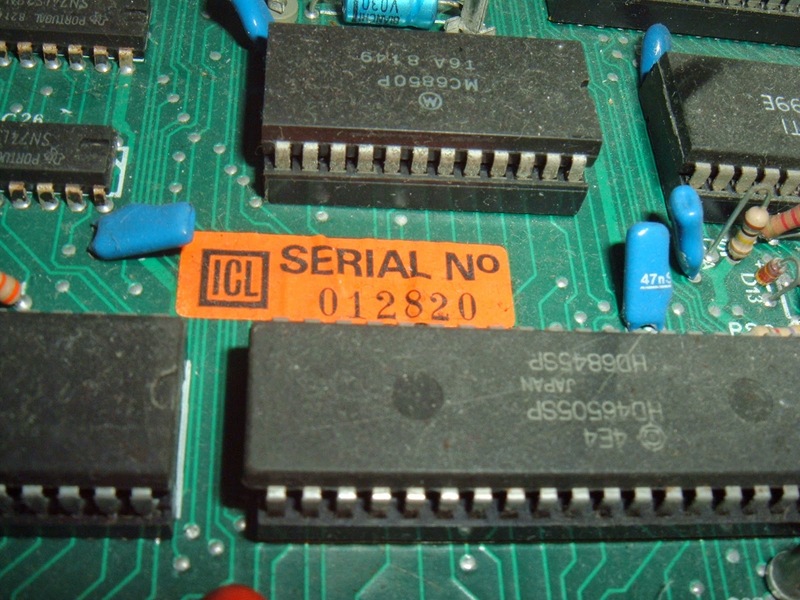 There is also an ICL serial number sticker matching the board. The lid was a bit dirty, but cleaned up alright. The other thing that usually gets pushed out is the slot on the side of the keyboard. 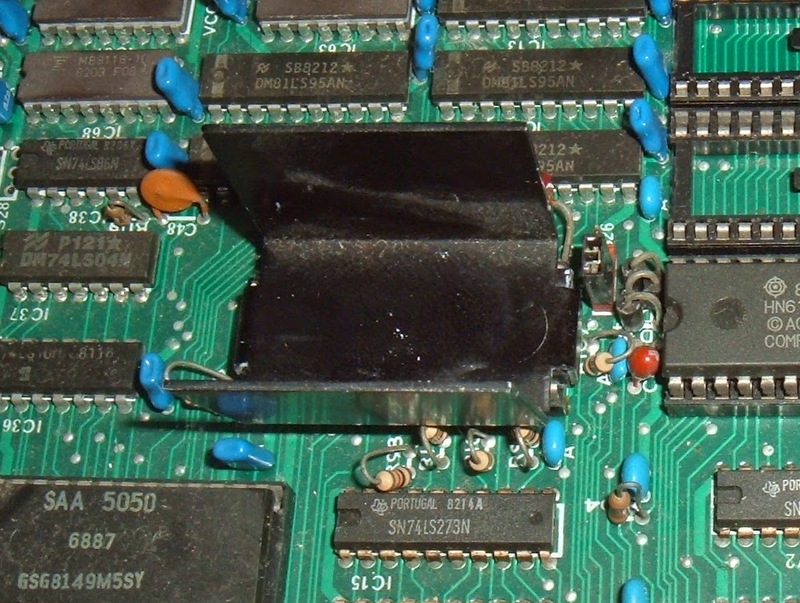 This was designed for plug in modules to expand the speech chips, and some third party add-ons use the hole to add a ZIF socket connected to one of the ROM sockets. Again I covered it was a bit of card. I also replaced the perspex cover strip with a slighly clearer 'BBC Microcomputer' legend. 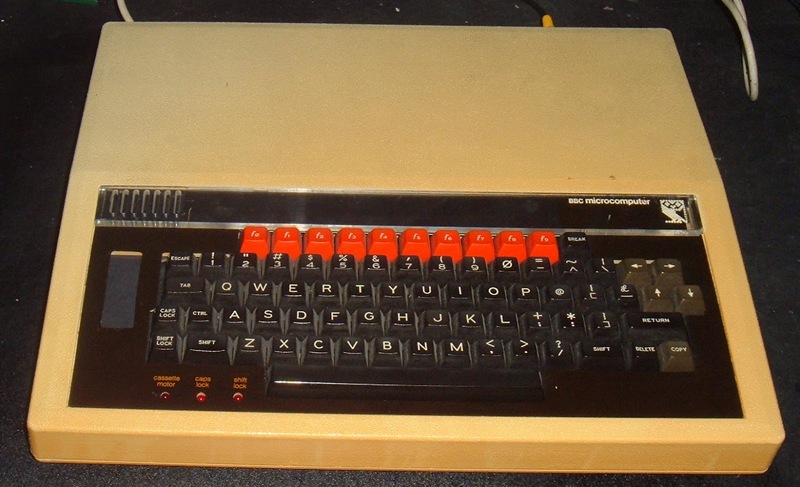 Later BBC's said 'British Broadcasting Corporation Microcomputer'. It looks a lot yellower in the photos. It doesn't look too bad. So there it is, an assembly of parts from various sources, but something like an issue 3 model B.
Oh yes, and it works. BBC's usually do.